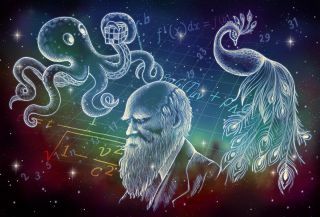 Astronomers, biologists and other scientists are discussing the nature of alien intelligence during a daylong workshop on May 18, 2016, at the International Space Development Conference in Puerto Rico. Scientists are gathering in Puerto Rico today (May 18) to discuss the many forms alien intelligence could take. This effort will draw upon the incredible diversity of life on Earth, conference organizers and participants said. "Philosophical questions aside, from a pragmatic perspective, if we are to send a message, we must design it in a way that it can be understood and used by the broadest range of forms that intelligent life could take," University of Washington biologists Dominic Sivitilli and David Gire said in a statement. "We can make substantial progress toward this goal by understanding the diversity of forms that intelligent life has taken on this planet." For example, it's possible that sexual selection — which drives the evolution of traits that don't aid survival but do impress potential mates — has played a larger role in the development of human intelligence than "normal" natural selection, said biologist Anna Dornhaus of the University of Arizona. "If this is true, then we should expect cognitive ability — i.e., learning, memory, abstraction and many other elements of intelligence — to be commonplace in the galaxy as they are among organisms on Earth," Dornhaus said in the same statement. "But 'exaggerated' intelligence, as in humans, may be a rare accident of chance, as rare as a peacock's tail." The SETI workshop is part of the National Space Society's International Space Development Conference (ISDC), which takes place from today through Sunday (May 22) in San Juan, Puerto Rico. "By launching ISDC 2016 with a daylong meeting on the nature of intelligence in the universe, we set the stage for an engaging conference that includes sessions on the habitability of other worlds, the latest research from Arecibo Observatory and updates on cutting-edge space missions like Breakthrough Starshot to Alpha Centauri (Pete Worden) and New Horizons to Pluto (Alan Stern)," said Dave Dressler, ISDC 2016 program chairman.